She put off the appointment for too long and missed her chance. Flu season had arrived with a vengeance and Teri Wilson’s doctor’s schedule was full. Along with her daily meds, the yearly flu shot kept the chronic asthmatic out of the ER and off her nebulizer. Now she stood in line at her local pharmacy to pay out-of-pocket for a flu shot from people she didn’t know. All because she dreaded making that appointment. Because Teri Wilson was afraid of needles. Not just, oh-this-is-going-to-hurt afraid, but anxiety-laced, blood-pressure-raising, vomit-inducing, pass-out-on-the-floor afraid. It was an irrational fear, she knew, especially for a woman of her years and medical history. But when Teri looked at a needle, she didn’t see the long hollow pointed part of a hypodermic syringe used to deliver medicines or fluids to her body to help her. She saw a Viking’s sword, poised over her in battle ready to pierce skin and bone and eviscerate her very soul. And no amount of counseling, sedatives, or taunting had ever been able to change her. Family and friends who took turns escorting her to medical appointments to hold her hand—or hold her down—would be exhausted from the physical struggle. Teri’s husband, Leonard, made fun of her and called her a big baby. His smugness annoyed her and wasn’t close to the level of compassion she felt a spouse should have. Leonard’s lack of support wasn’t the reason Teri filed for divorce six months ago, but she’d find room to squeeze it in among his long list of flings, affairs, overspending and other mid-life crisis issues. As if on cue, a couple in line behind her sniped at each other. Teri heard the woman scoff. Their voices lowered into cooing and breathy kisses and Teri mentally applauded the man for at last speaking from his heart and not his head. She hadn’t been so lucky. The line moved forward five steps and Teri craned her neck to see a divider was added to make second booth to assist with the small crowd. Droplets of perspiration formed around her ears and hairline. Don’t start this, Wilson. It’s just a flu shot. Stand still before you embarrass yourself. She took two cleansing breaths to calm herself and went back to people-watching. Her gaze fell on a dark-haired boy of about five three places ahead of her in line. His mother had a firm grip on his hand while her other hand-held the ereader she focused on. Teri watched the well-behaved child and smiled. He appeared to be talking to himself while waving his hand around in the air. Her smile grew into a grin as her curiosity got the better of her. Teri tapped the shoulder of the man in front of her. The adults took a step forward and leaned toward the child. This got the mother’s attention, and she faced the small group, a sheepish look on her face. “Does it work for him?” the young man asked. Both men high-fived the boy and knelt to talk with him as his mother looked on, smiling. Teri was speechless, mesmerized by the child’s eyes. They reminded her of Boyd at that age. A chocolate-brown so soft it resembled velvet. What intrigued her about Nicholas’ eyes was the ring around his irises in gradient shades of gold. The contrast of the deep brown against near-platinum hues created a glowing effect. At least it did to Teri. No one else appeared to notice. The younger man and Nicholas were in an animated conversation about Peppa Pig while his mom and the other gentleman seemed pleased to find out they were both single… and available. A couple with two pre-teens moved to the reception counter and now Teri was fourth in line. A dull roar sprang to life right behind Teri’s ears and competed with the butterflies in her stomach. Clenching her fists, she tried to will away the sense of dread moving through her. Touched by his concern, Teri looked at the boy… and gasped. His beautiful eyes were glowing. Nicholas’ mom was at the counter filling out forms. The two men discussed their last bouts with the flu. The line behind her carried on with their conversations, reading, and looks of boredom. No one saw the golden light shining from the child’s eyes. Teri turned back to the tyke, but he was disappearing behind the divider next to reception with his mom. She rubbed her temple, unsure of herself and what she saw. Listen to yourself, Wilson, you sound crazy as hell. But you’re standing too close to miss it. About to give in and ask the men if they’d noticed anything different about Nicholas’ eyes, Teri was interrupted by crying from the far divider. Her mind remembered where she was and why and her anxiety rushed back to the surface. More crying followed by soft wails assaulted Teri like a punch in the gut. She stepped around the two men in front of her to lean against the counter no longer trusting her legs. The preteens reappeared ahead of their parents, heads bowed and clutching their arms. Not even their father announcing a stop for chili dogs and fries could raise their tear-filled faces. “Guess I’m up next.” She heard the young guy say as he zipped behind the divider. Why is he so happy? They’re about to plunge a piece of metal into his skin. The pharmacy aide slid a health form over to Teri. Focused on not throwing up, she wasn’t sure what she put on the form but by the time Teri finished the young guy was waving and heading up front for the exit as the first man took his place. Her vision blurred and Teri cursed herself for allowing pride and a bad attitude to let her come here alone today. She wanted to bolt but knew she’d never make it to the parking lot. Patting her coat pockets, she searched for her phone to call Boyd. Her oldest child was the only person who would come for her and not judge her. Much. Startled by a sudden jolt, Teri looked down at her hand where the sensation started, to see Nicholas stroking her fingers. She studied the child as she allowed him to lead her behind the divider. His mother was fastening her jacket while the nurse gave her aftercare and injection site instructions. Nicholas stopped at the small exam table and motioned for Teri to sit. She considered him again. He was a compassionate young boy who could sense unease in others, one of those old souls people spoke of. Teri chastised herself for thinking Nicholas was anything else. His mom held out his jacket for him, but before walking away, he gripped Teri’s again. He ran to his mom and slid into his coat. Teri removed hers while the nurse changed gloves and readied a new tray. Teri’s brow knitted in confusion. She was rolling up her sleeve as a nurse prepared a flu injection a few feet away. And she wasn’t freaking out. The anxiety and nausea which plagued her only moments ago were gone. No perspiration trickled down her back. How had she conquered a lifelong fear in a few minutes? And why today of all days? The nurse sat the tray on the table next to Teri. She still wasn’t happy about the shot but she was no longer crippled with fear or filled with dread. Teri watched the nurse open the alcohol swab and wipe a spot on her arm. She looked up to see Nicholas peeking around the divider. “Wowie Zowie!” He waved his hand through the air, then ran off. Teri jerked her head back to see the nurse removing her gloves. She looked at her arm and her eyes widened to see a band-aid in place. The two women chuckled. Teri hurried to get her coat back on, only half-listening to the nurse’s instructions. She had to catch Nicholas. Thanking the nurse, Teri headed for the front of the store. As she passed the flu shot line, she froze. Teri opened her change purse and took out two twenty-dollar bills and folded them in half. The couple who’d bickered over the cost of the shot were now near the front of the line. Teri grabbed the surprised woman’s hand, placed the bills in her palm and folded her fingers over them. Smiling, she turned and rushed toward the exit in search of a special five-year-old. Her heart fell as she stood in front of the store and looked out across the parking lot. Nicholas and his mom were nowhere in sight. What just happened? I’ve never gotten a shot in my life without putting up a fight or getting sick, and today, I didn’t even feel it. Resigned, she headed to her car, replaying the last hour in her mind. Teri thought she was in the wrong row until she saw the bumper of her Altima sticking out just past a large, windowless, commercial van. Her smiled returned as she passed the van. Between the van and her car sat a Nissan Xterra. The woman sat in the driver’s seat talking on her cell. Teri looked inside the car as she opened her own door, to see the child fastened in a mini car-seat. She heard their engine start and waved to get his attention. He glanced in her direction and smiled, returning her wave as his mom pulled out of the parking space. Holding Teri’s gaze, Nicholas waved the same hand through the air… and his eyes glowed. They drove off, leaving the dazed woman standing there, her own hand held up in a frozen wave. Teri dropped her hand, looked around to see if anyone witnessed what just happened, then got in her car. Sitting behind the wheel, Teri Wilson tried to make sense of her situation. An adorable little boy… with glowing eyes. No one else appeared to notice. And no one would ever believe her story. She started her car and left the parking lot. Remembering the child’s words, Teri decided being believed wasn’t important. This is part of a scene from the upcoming Family Matters, book 2 of In the Best Interest of the Child. 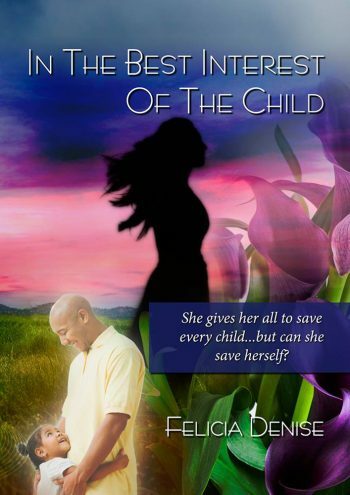 Olivia Chandler is at the bedside of Willis Benson, her lifelong protector, as he lay dying. Her fear of abandonment threatens to overwhelm her until Willis reminds her of one important detail. “July?” Thoughts and images raced through Olivia’s mind. She’d spent time with Willis on five or six occasions in the last four months. And never suspected a thing. Ian became a blur to Olivia. Dizziness and nausea gripped her, Heat enveloped her body as sudden fatigue caught hold and dragged her toward the floor. Ian was the only reason Olivia didn’t fall. He held on and propped her against the wall. Ian spoke to her but Olivia heard no words. Her jumbled thoughts were of Willis Benson, the man in the brown suit she met as a ten-year-old. The only constant in her life since that fateful day when everything changed. Ben Chandler planned well for his daughter’s future. But it was Willis Benson who fought for Olivia… and her mother. He risked his own job future and status in the firm to carry out Ben’s wishes. When Olivia turned eighteen and took partial control of her inheritance, Willis was at her side. He answered Olivia’s questions and gave mild guidance, but Willis insisted she make her own decisions. Years later when Olivia refused to visit her mother ever again, Willis accepted it and continued to stand by her. Now Olivia needed to accept the fact if… no, when Willis suffered another cardiac episode or seizure, no life-saving measures would be taken. He would die… and leave her. With a sense of urgency, Olivia attempted to break Ian’s hold on her. With a simple nod, Ian took Olivia by the hand and returned to his father’s room. Malcolm Benson had his chair pulled close to the bed as he clasped one of Willis’ big hands between his own. Not as tall as Ian or their father, Malcolm had more brawn. He rose from his seat and pulled Olivia into a one-arm hug while still holding his father’s hand. Olivia smiled and stepped past Malcolm to greet her lifelong protector and surrogate father and was shocked by Willis’ appearance. She and Willis spoke at least once every week by phone, and several times by text, but six weeks had passed since their last face-face meeting. It was hard for Olivia to reconcile the lively, robust Willis Benson from late summer with the pale, gaunt figure before her. He was twenty-five pounds lighter… at least. Drawn skin over his neck and jawline gave the older attorney a skeletal look. Olivia’s jaws ached to hold onto the smile which masked her breaking heart. However, when she looked into the dying man’s eyes, her soul calmed. Life was leaving his body, but the piercing blue eyes of Willis Benson reflected all the wisdom and wit Olivia admired and loved for so many years. She stopped him with a gentle touch to his lips. He placed his hand over hers and squeezed. Olivia laughed even as her tears flowed down her face. He winced, new pain breaking through, defying the powerful IV drug cocktail started only moments before. Willis closed his eyes but continued to speak. He opened his eyes and regarded Olivia warmly. Olivia clutched the dying man’s frail hand. With effort, Willis raised his hand and covered hers. Willis went on before Olivia could speak.